Evernote, everybody's favorite note-taking app platform that allows you to record data using a variety of mediums, including notes, snapshots and recordings, released an update to the Android version of its app yesterday, with a number of advanced features many users have been clamouring for. Firstly, Evernote stores a wide variety of different types of notes and information, so it can often become difficult to locate the specific note in question. The latest update alleviates this problem by allowing users to construct advanced search parameters using filters like note tags, notebooks, attributes, location and dates. These advanced searches can then be saved to be accessed later. Many notes created in Evernote are lists or "to-do lists" where tasks are periodically completed and must be "checked off". The web and desktop versions of Evernote have the ability to insert checkboxes into notes. This update to the Evernote app syncs the checkboxes to your phone, so that whenever a task in a note is completed, it can be checked off. 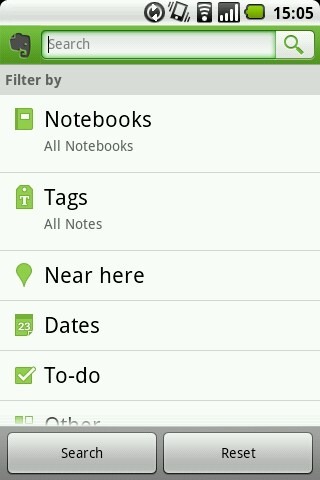 Notes will also now sync faster and are less prone to errors while uploading and downloading notes. The sync status bar also provides better information while notes are uploading and downloading. A simple text-only view of the notes list has been added, which loads faster with many notes. A full screen mode has also been added for reading notes. 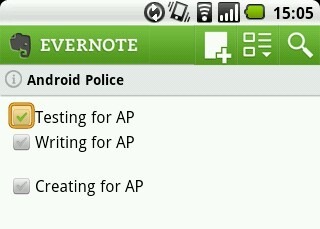 Evernote for Android can be installed from the Android Market.